thanks to the energy savings. 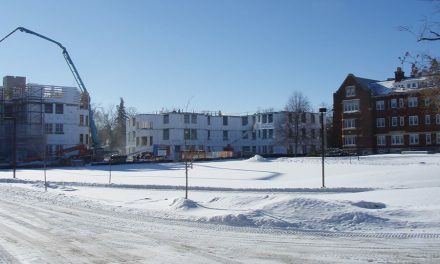 With tight economic conditions in all parts of North America, an increasing number of property owners are choosing to remodel or retrofit their existing buildings instead of moving into new construction. The trend is catching on in both residential and commercial sectors. A significant number of these remodels and retrofits are done with the primary goal of improving the building’s energy efficiency, and that’s where ICF contractors can take advantage of this trend. A variety of foam products, including standard insulating concrete forms (ICFs), can be used to deliver energy efficient, green additions and remodels at a very cost-competitive price point. The entire report, published by Harvard University and titled The Remodeling Market in Transition, is available for download from this magazine’s website. 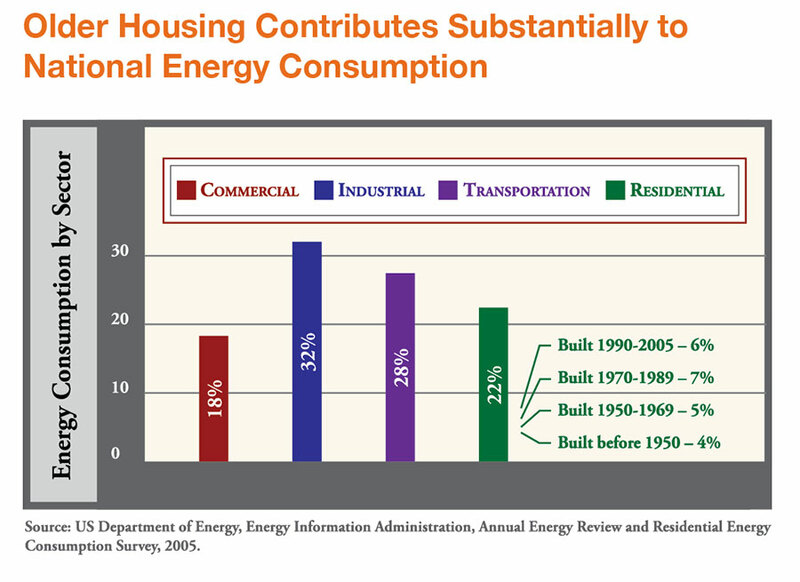 The reason energy efficiency is such a big deal for homeowners—and remodelers— is that existing homes consume 22% of the nation’s energy, and homes built before 1970 are responsible for about 40% of this. A study conducted for the California Homebuilding Foundation last fall found that 70% of residential greenhouse gas emissions is created by homes built before 1983. These older homes are a prime market for energy-efficient upgrades, especially since the federal government is providing major tax incentives to help finance such improvements. Evidence indicates that homeowners are willing to pay for quality insulation. About 65% of remodeling jobs include insulation replacement, another 27% installed insulation on foundations. One of the most common remodeling projects is insulating and finishing residential basements. Two relatively new products make this simple to do. The first, InSoFast, is designed specifically for this type of job. It resembles a common ICF panel, a two-inch-thick piece of EPS foam measuring 24x48 inches, with exposed black vinyl furring strips. 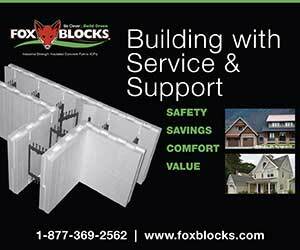 It’s a great way to create the energy benefits of ICF with existing concrete or block walls. 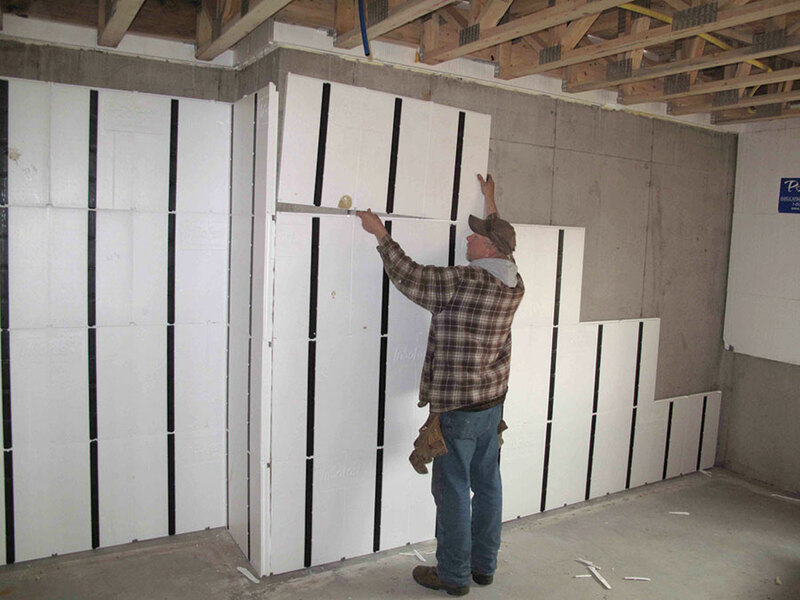 Rigid EPS panels like these from InSoFast offer many of the advantages of ICFs: minimal labor, little mess, and high-quality continuous insulation. 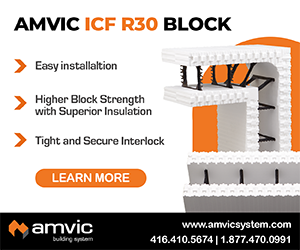 It has many of the installation advantages of an ICF, too: minimal labor, very little mess, and high-R-Value continuous insulation. The interlocking panels are simply fastened to the wall with construction adhesive. Pre-cut wiring chases and built-in moisture channels make the job go even faster. Quad-Lock’s R-ETRO panel also combines furring and insulation into a single product. It combines the standard Quad-Lock panel, which measures 12x48 inches, with a special tie which is mechanically fastened to the wall. Because the ties must be physically bolted to the wall, it takes a little longer to install than the first product, but not much. The R-ETRO system also requires the installer to cut their own utility chases. The primary advantage of this second system is that the foam panels come in a variety of thicknesses—up to 6 ¼”—for R-Values of R-26 and higher. And either system is significantly faster than traditional methods. Both systems can be installed on the inside or outside of the wall, and on ceilings and floors as well. As a third option, Arxx Corp. is developing a retrofit panel based on the old Eco-Block design that should be ready for market this fall. InSoFast and Quad-Lock’s R-ETRO can be used on above-grade walls as well. 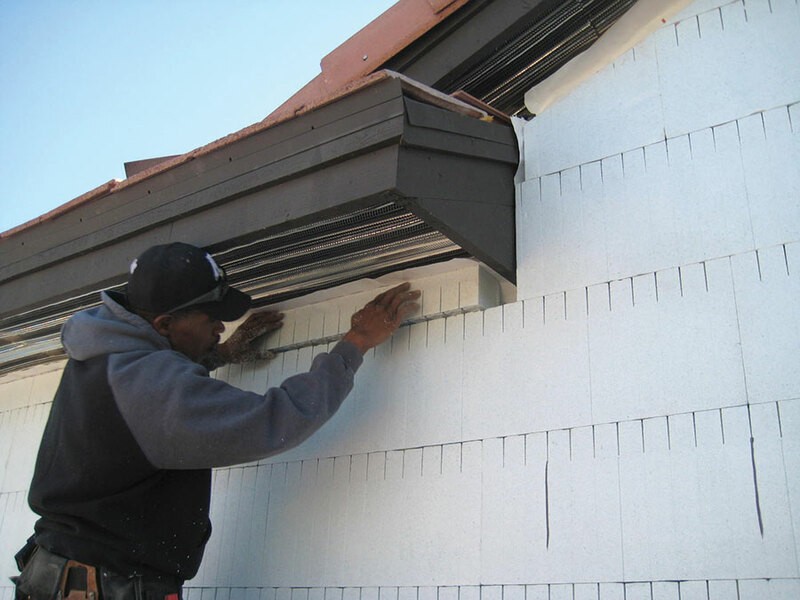 In this application, they’re typically installed on the exterior. This takes advantage of the thermal mass of the wall and avoids reducing interior living space. 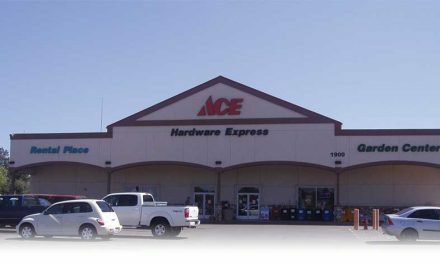 A great example is a 1,500 sq. ft., two-story home in Whitby, Ontario, Canada. 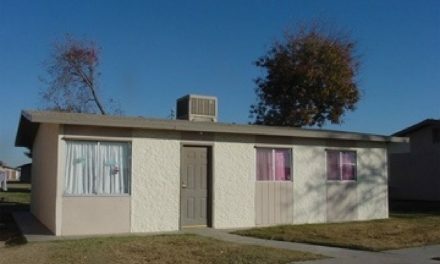 Constructed in 1954, the brick home was built with no exterior wall insulation, giving the walls an R-Value of only R-5. Considering that local temperatures can reach 95 degrees in the summer and drop below zero in winter, the home was a prime candidate for an energy makeover. 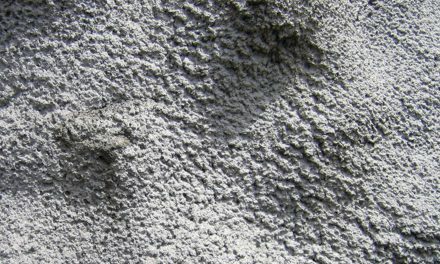 Exterior insulation improved wall performance from R-5 to R-24. The home received a facelift as well. The total cost of the upgrade was $5,600. Annual energy savings are estimated at $1,370, giving a payback period of about four years. When government tax incentives are included in the calculation, it’s even less. These savings seem to be fairly typical. According to the California Homebuilding Foundation study cited earlier, spending $10,000 to improve the efficiency of a 1960s-era home could easily save 30% on energy bills and save 8.5 tons of carbon annually. Remodeler Devon Hartman of HartmanBaldwin, a Claremont, Calif design/build firm, reminds builders that HVAC equipment can often be downsized as well. On one recent project, Hartman was able to replace four older heating and air conditioning units totaling 16 tons with a new 6-ton system. If the project involves adding additional rooms or even a detached “mother-in-law” apartment, conventional ICFs are often a great choice. They’re especially good if there’s limited room at the jobsite, or if energy efficiency is a top priority for the owner. Steve Tinter, general manager at Cook Brothers, a green remodeling firm in Arlington, Va, warns that remodeling jobs are often more complex that new builds. 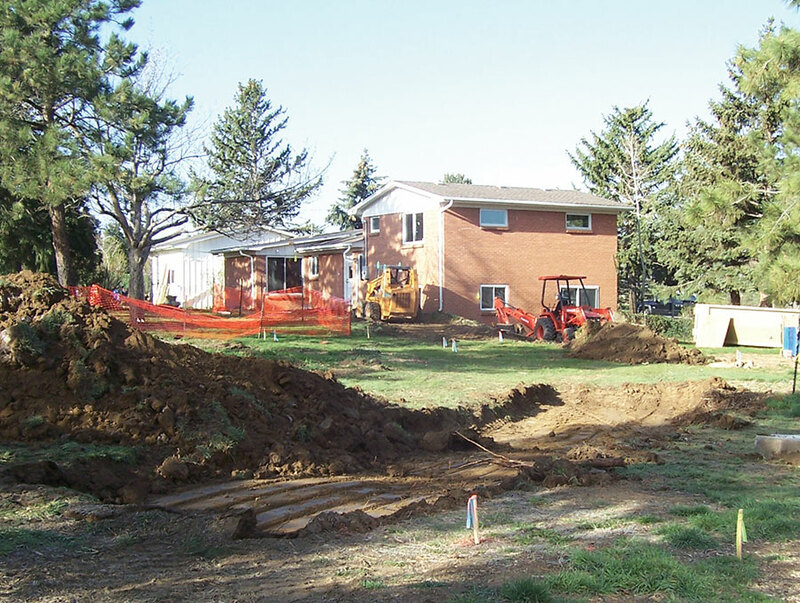 Using ICFs for additions, like this Colorado home did, creates long-term savings. It also helps gain a foothold in the “green building” sector. This project is certified LEED-Gold. Dale and Elizabeth Smith, partners at Boulder, Colorado-based Fanas Architecture, recently completed a residential remodel/addition job with ICFs. The project is pending LEED-Gold certification. The 1,800-sq.-ft. split-level home was built in 1959. 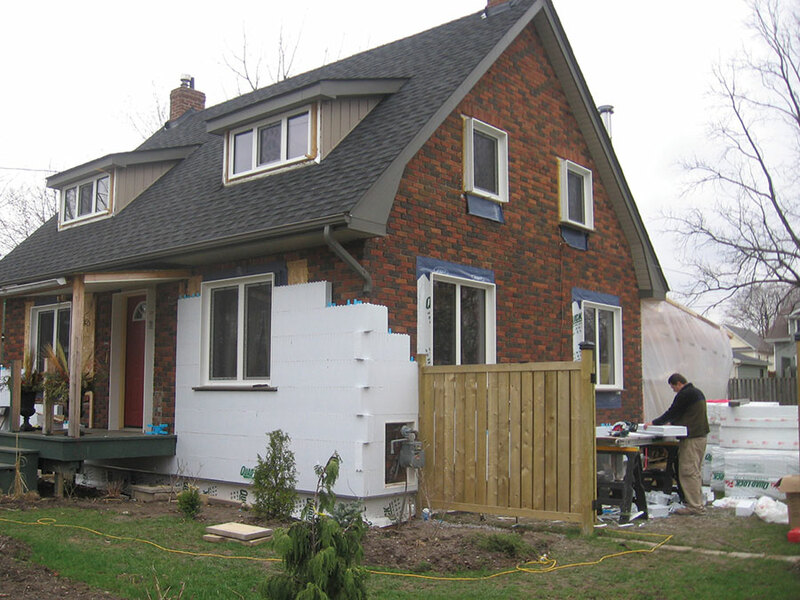 Like the Canadian home mentioned earlier, this house had extremely poor insulation. Builders installed new batt insulation made from recycled denim in the exterior walls and ceilings, and an additional one-inch layer of rigid insulation to the exterior walls. Windows, furnace, and hot water heater were all upgraded with high efficiency models. A 2,000 sq. ft. addition, which more than doubled the size of the home, was constructed using Durisol, a cement-wood fiber composite block. 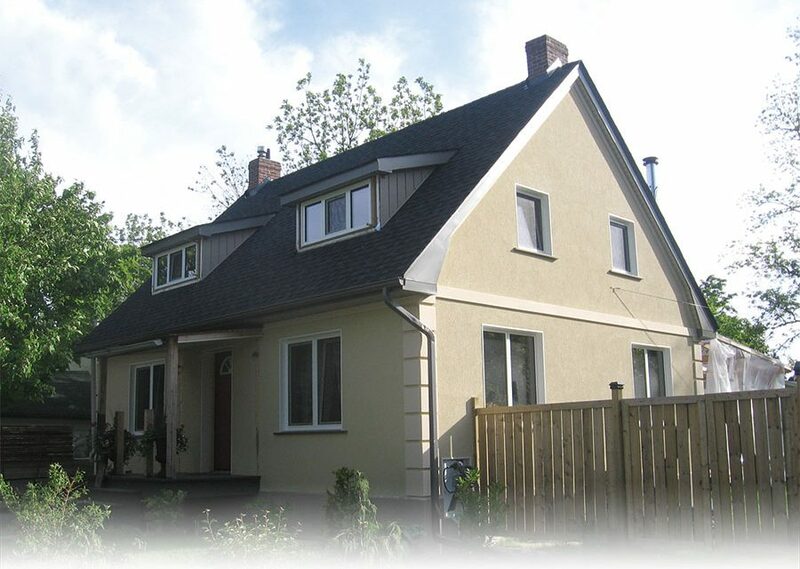 As may be expected, the primary reason for selecting an ICF was the thermal mass they provide. The addition also included critical mass roofing material, photovoltaic and solar heating technology, coupled with radiant in-floor heat, and sustainable interior finishes. Triple glazed high-efficiency windows complete the shell, and low-flow plumbing fixtures and appliances ensure the interior is efficient as well. An additional example of using ICFs for remodeling is on pp. 16-17 of this issue. In most cases, energy efficient or “green” remodeling costs slightly more than its conventional counterpart. However, an unprecedented number of rebates, grants, and tax incentives exist to offset these costs. Home Energy Efficiency Improvement Credit—Consumers who improve the energy efficiency of their home can receive a tax credit for 30% of the cost, up to $1,500. Among the products that qualify are energy-efficient windows, doors, roofs, heating and cooling equipment and insulation. The item must be “placed in service” between Jan. 1, 2009 and Dec. 31, 2010. 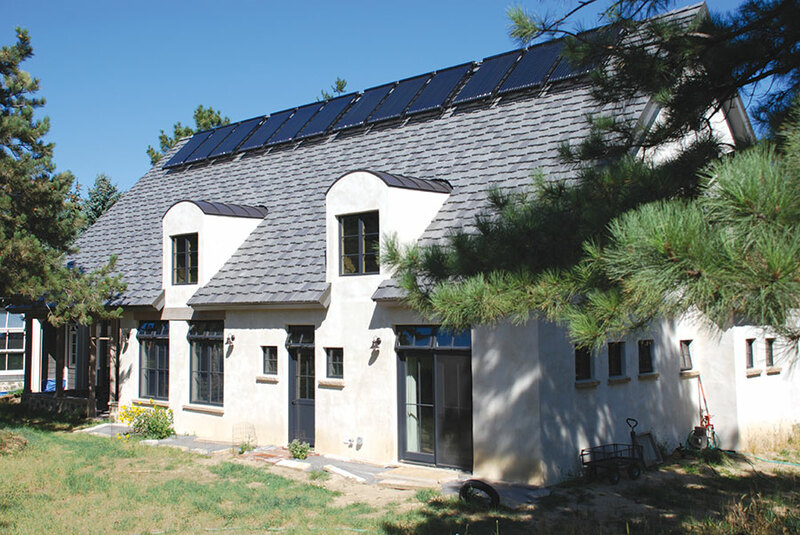 Residential Renewable Energy Credit—If the remodel includes systems that generate electricity—such as solar water heating, photovoltaic panels, small wind turbines, and geothermal heat pumps—up to 30% of the cost can be recouped. Systems must be installed in the next five years, before December 31, 2016. Utility Rebates—In addition to federal tax incentives, some consumers are also eligible for rebates from their state government and or utility provider. In Utah, for example, both the electrical company (Rocky Mountain Power) and the natural gas utility (Questar) offer hundreds of dollars in rebates for homes that add insulation. Combined with the federal incentives, these rebates cover the entire cost of many projects. State Rebates and Tax Incentives—Most state governments—and some large cities as well—also offer tax incentives and rebates for energy-efficient homes. Most states have an energy office website with information on specific energy-efficiency rebates and tax credits. It’s probably the best place to start. The Database of State Incentives for Renewables and Efficiency (DSIRE) is another great online resource for information on federal, state, local, and utility incentives. A link to the site is included in the online version of this story. 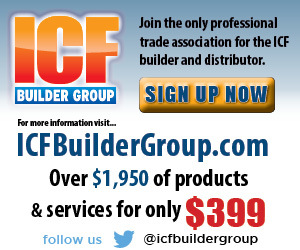 The www.icfmag.com website also includes links with more information about the Federal tax credits for energy efficiency. Other Incentives—In addition to the benefits mentioned above, the promise of lower energy bills is a tangible benefit that helps pay for the upgrade. If the so-called “cap-and-trade” law passes the Senate (it already passed the House), it could add an average of $1,500 of additional energy costs to each household in the United States—a major incentive for upgrading. Lastly, there are the intangible benefits such as increased indoor comfort, reduced air pollution, and the satisfaction of knowing your home is minimizing damage to the environment.